What is my home worth in Tahoe City? What is my home worth in Tahoe City? Market conditions have changed in the past few years. 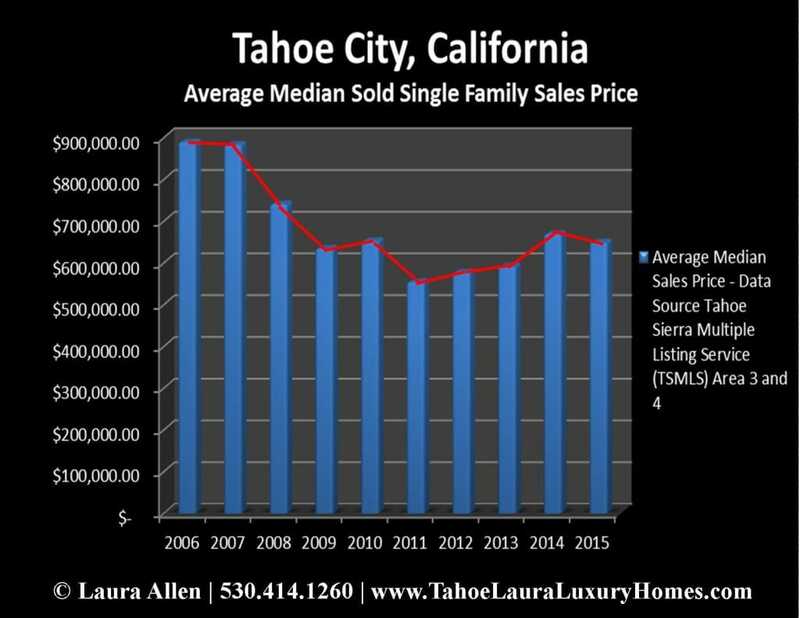 Check out the current over-all market real estate data as of 03-04-2016 to get a better idea of the Tahoe City real estate market conditions. The demand for cabins and mountain homes in the Tahoe City area continues to be strong because of the wonderful coveted location that the Tahoe City area has on both the North Shore of Lake Tahoe and the West Shore of Lake Tahoe. The variety of different neighborhoods in this community gives home owners a wide variety of options from being in a remote forest setting that is still just steps from the high-speed Sherwood ski chair lift at the top of Ward Canyon that will take you to the ski slopes of Alpine Meadows to many neighborhoods that are very close to the beaches of Lake Tahoe. The Tahoe City community continues to be a top choice for home owners! 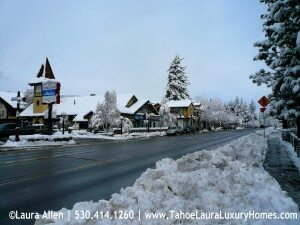 The Tahoe City area is centrally located at the junction of Hwy 28 and Hwy 89 S known as the “Y” in downtown Tahoe City. Tahoe City stretches out about 3 miles east on the North Shore (Hwy 28) and about 2.5 -3 miles south on the West Shore (Hwy 89S). Today, Tahoe City is known for its charming village atmosphere where you can shop, dine out, and enjoy time at edge of Lake Tahoe and never have to get back in your car until it is time go home. Tahoe City has several public beaches, including Commons Beach, which is located in the heart of the downtown area, but you’ll also find public beach areas on the North Shore and West Shore areas, not to mention a wonderful paved bike/walking trail path system that allows you to take in our scenic beauty. This North Shore community makes it easy to get to Alpine Meadows, Squaw Valley, Homewood, or Northstar Ski resorts. It is symbolizes all of the Lake Tahoe recreational activities such as boating, hiking, biking, tennis, golf, miniature golf, skiing, shopping, restaurants and so much more that the Lake Tahoe -Truckee area has to offer. Are you ready to find out what your Tahoe City home is worth? Just click on the link below and you will be asked to provide us with some information on your Tahoe City property and I will get you a complete home market valuation report. While I’m all for technology, I have found that the instant home values and market estimates that the automated programs can produce are often very inaccurate and let’s face it, accuracy counts when it comes to your money and what your home is really worth, so let’s do a real evaluation on your property. Let’s take the time to make sure we have the right data and information on your Tahoe City property. We know that each Tahoe City property is unique and we want to make sure your mountain home gets all of the credit and value it deserves for all of those special features before we place a value on it. What are the hot-button features Tahoe Second Home Buyers are looking to find? How can you make your Tahoe City lakefront, mountain home, or cabin stand-out from the rest? If you’re thinking of selling your Tahoe City home it will be more valuable if your property has any of these updates, and/or features. 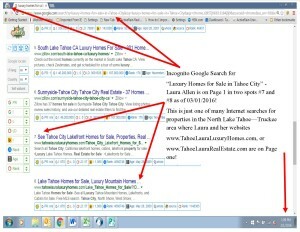 As a Tahoe City Seller did you know that more than 92%+ of home buyers will begin their property search on the internet? Now, more than ever your mountain house needs to have the best on-line exposure, presentation, and coverage possible. On-line marketing is so much more than just entering your property data and a few photos in the Tahoe Sierra Multiple Listing Service (TSMLS). Internet marketing is far more advanced today. Long gone are the days of only putting in the bare minimum property information data and details along with just a few poor camera photos and then counting on the TSMLS to syndicate that information out to a few mega real estate websites. As a Seller if your agent is hoping this will worth to get potential buyers to call about your home, you will be very disappointed with the results. Serious buyers view an on-line listing with limited and/or incomplete information and poor, or no photos, as a being a big negative. Many buyers view poor MLS listings as a property that may have something to hide – not the impression you will need to get top dollar for your Tahoe home. Tahoe Seller Tip – Provide as much information and property details as you can on your property. The more information, the better! Tahoe Seller Tip – On-line Curb Appeal! Pick the best photo as your first photo that will get buyers to click on your home listing to get more information. You may not have thought about how important your first position photo is to a potential buyer, but the Internet has become your very first showing to home buyers. It is critical that your first photo have on-line curb appeal and it sends the right message about your property! Each on-line viewing is your first showing! Every time your home is viewed on-line that Tahoe buyer is making that critical first impression decision on whether or not to have your Tahoe City home on their short list of properties to see when they come to Lake Tahoe. Unlike other markets, this second home market often has buyers here for only a few hours to see properties. Your on-line presence will impact that buyers “must-see” showing list, which means you need great photos of your property. 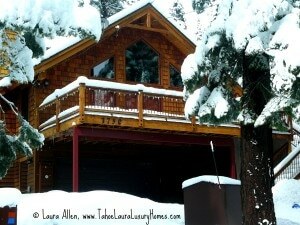 Tahoe Seller Tip – Only use the best photographs to market your Tahoe Property! To achieve the broadest world-wide Internet marketing exposure and presence, your Tahoe City property needs a combination of a fully completed TSMLS property profile, social media campaign, blogging, and video exposure. Experienced real estate agents that understand a strong on-line marketing plan when combined with other key traditional home marketing strategies can really make a difference in getting the word out about your Carnelian Bay home for sale. Do you want to know if your Tahoe Real Estate Agent understands how Internet Marketing works? Just check out where Laura Allen with her own real estate website and where it ranks on Google Page 1 for the internet search “Luxury Homes for Sale in Tahoe City”. 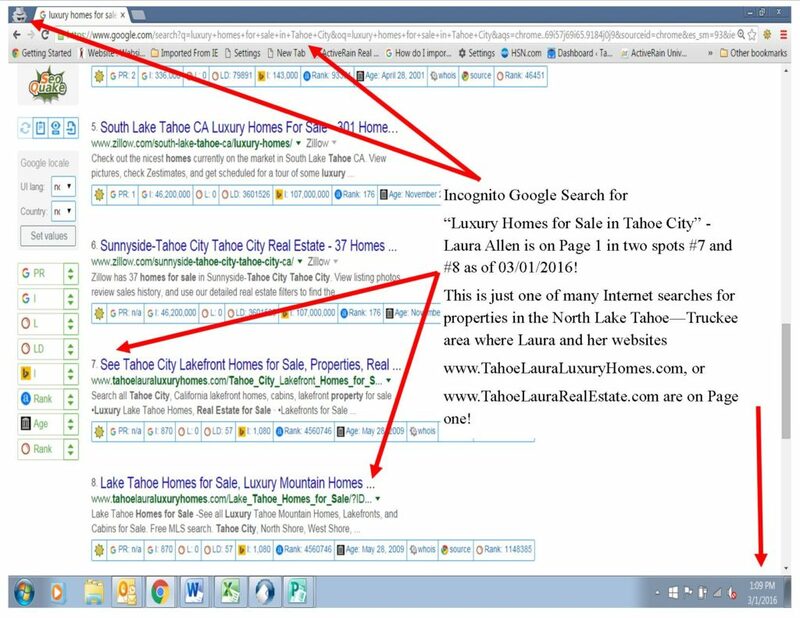 Laura Allen is a Tahoe REALTOR that understands what needs to be done when it comes to Internet marketing and is getting page one results! Want to know more about Laura Allen and her success rate? Need more help in trying to figure out your greater Tahoe City and North Lake Tahoe home buying options?